Could these be the most breathtaking and elegant theatres in the world? The design of a theatre venue can have a big impact on the experience of seeing a live performance. But if you’re thinking about designing or refurbishing your theatre, there are so many choices that it can be hard to decide what direction to take. The route you go will be partially dictated by the architecture of the venue itself, but there are other factors, such as the kind of image you want to project to your patrons and the type of performances that will be staged. Here’s some inspiration from some of the most breathtaking and elegant theatres in the world. The Sydney Opera House is an iconic world-class building that’s instantly recognisable to people from all over the globe. The exterior is reminiscent of a ship’s sails and is set off against the backdrop of the gorgeous blue ocean. The architect, Jorn Utzon, also created a stunning, modern interior that wowed theatregoers when the venue opened in 1973 – and continues to wow them today, almost forty years later. 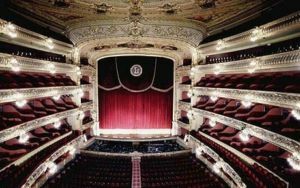 Gran Teatre del Liceu, Barcelona, which opened in 1847, is an older theatre that is renowned worldwide for its opulent interior and beautiful classical architecture. The interior features rows of gilded red velvet seats, and ornate architectural details abound. The Royal Opera House in London is another Victorian building, built in a neo-classical architectural style, with an imposing facade, complete with Grecian columns. Inside the Royal Opera House lies elegant seating and an enormous red velvet stage curtain embellished with gold detailing, which completes the ostentatious decor that was so typical of the Victorian era. Although budget is always a constraint, looking at iconic venues like these can help give you ideas and inspiration, as they are arguably amongst some of the most beautiful theatres in the world. Creating the right ambiance for your audience is a vital component to a successful theatre.